This is version 2 of the outside frame patterns for Blanche. It’s turning out to be a bit of a trial and error operation to get everything lined up and in the right place but I’m still reasonably confident this approach is going to work. Version 1 ended up with the cab sitting too low and I think this one is slightly too high (compared to the tender). 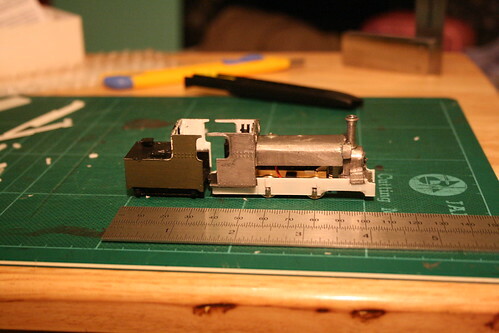 It’s possible that the mechanism is about 1mm too tall for the body but there is scope to mill out the top of the saddle tank casting to help it sit a bit lower or, in the worst case scenario, replace it with much thinner (and lighter) plasticard. The next step will be to measure the parts of the kit against scale drawings to find out how accurate it was in the first place. The main aim here is to settle the relationship between the tank, smokebox and cylinders as the frames need cutouts to take the cylinder mounts. I’ve also made the new frames slightly longer at the front as the drawings indicated they were extended slightly when the Ffestiniog added the pony truck.